Today marks Harry Potter’s 38th birthday. And as we’re so, so very British here at Raspberry Pi, we have no choice but to celebrate the birth of The Boy Who Lived with some wonderfully magical projects from members of the community. Build your own Daily Prophet After a trip to The Wizarding World of Harry Potter , Piet Rullens Jr wanted to build something special to remember the wonderful time he and his wife had at the amusement park. 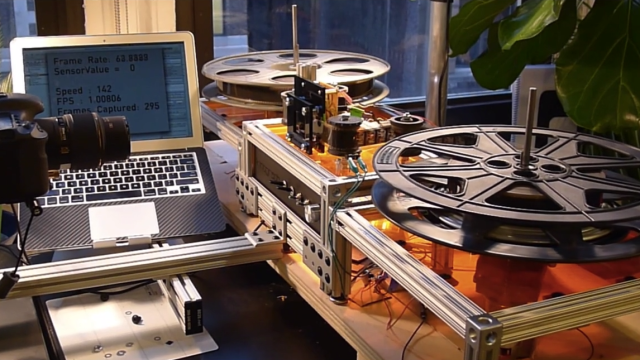 Joe Herman’s Pi Film Capture project combines old projectors and a stepper motor with a Raspberry Pi and a Raspberry Pi Camera Module , to transform his grandfather’s 8- and 16-mm home movies into glorious digital films. We had mail this morning suggesting we watch the trailer for the new Point Break reboot closely. (Keep your eyes peeled at 1:23.) When we started the Raspberry Pi Foundation in 2012, we thought we’d just be teaching kids to code. It’s kind of discombobulating to find that we’ve been making movie props too. A great motivator for us in developing the Raspberry Pi was bringing down the cost of computing.